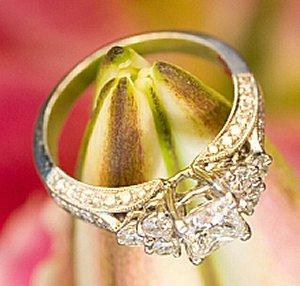 The mounting is the focal point and center stones of an engagement ring. Engagement ring mountings are a critical part of a ring's design that serves as the focal point for the piece, cradling the precious gem that symbolizes the precious relationship a couple shares. "Mounting" is a more technical term for the engagement ring setting that encompasses the head and shoulders of the ring, or the actual placement of the center stone and its immediately adjacent details. The mounting is the focal point of the ring, because a gemstone cannot be attached to the ring's band without some additional design elements; even simple mountings should be chosen carefully to highlight the best aspects of a diamond. There are three main characteristics of a ring mounting that couples should pay careful attention to when considering different engagement ring designs. Most frequently gemstones are attached via symmetrically placed prongs, such as in a classic tiffany setting, though more unique options such as bezel settings may completely surround the jewel with metal. Whatever type of attachment is used, it should be firm and secure to protect the gem from loss or damage. At the same time, it should be sized appropriately so it does not overshadow the gem and diminish its beauty. 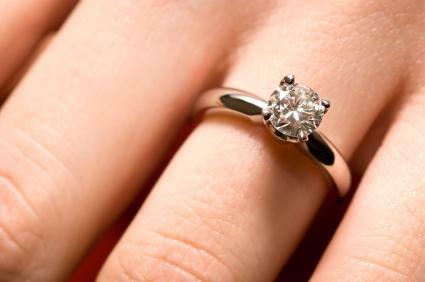 The type of precious metal used for engagement ring mountings can dramatically affect a ring's appearance. The metal should be strong enough to support the stone and withstand daily wear and tear - platinum, titanium and tungsten are the strongest metals, while silver and low karat golds are the weakest. At the same time, the metal's color should also reflect well on the gemstone. While a perfectly colorless diamond will be gorgeous in nearly any metal, a diamond with a slightly lower grade of color may appear much dingier if mounted in yellow gold. Most jewelers prefer to use platinum mountings because they offer a good balance between appearance, strength, and cost. Solitaire mounting allows maximum light to reach the diamond. The amount of light a mounting permits to reach the gemstone will directly affect its appearance. A closed mounting, such as bezel or channel settings, keeps the gem more heavily shrouded. This may be desirable for lower quality stones when a heavier setting can disguise and minimize diamond flaws and inclusions, but other stones will simply appear dim and less brilliant if the mounting does not allow enough light into the stone. Elevated designs encourage light, and even some enclosed settings may have open spaces beneath the stone to allow more light to pass into the gem. While most couples use the terms mounting and setting interchangeably, to jewelers and lapidaries they are very different things. The engagement ring mounting is almost exclusively the part of the ring that includes only the central gem, while the setting refers to the overall ring design including any filigree accents, side stones, engagement ring engraving, or other work along the band, such as a stunning pave setting. In most cases, however, if a couple inadvertently uses the incorrect term, the concept will still be understood. Choosing the right mounting is just as critical as selecting the right diamond, gemstone, or even the proper ring size. Because all eyes are drawn to the central part of the design when showing off an engagement ring, a poorly chosen, unbalanced, or inappropriate mounting will be immediately noticeable. Properly designed, however, the mounting will highlight the gem or gems as stunning sparkles on the bride-to-be's finger, and may even be able to enhance the stone's carat size, color, or clarity through cleverly designed visual tricks.